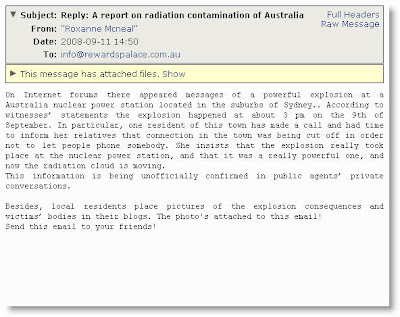 On Internet forums there appeared messages of a powerful explosion at a Australia nuclear power station located in the suburbs of Sydney.. According to witnesses’ statements the explosion happened at about 3 pm on the 9th of September. In particular, one resident of this town has made a call and had time to inform her relatives that connection in the town was being cut off in order not to let people phone somebody. She insists that the explosion really took place at the nuclear power station, and that it was a really powerful one, and now the radiation cloud is moving. This information is being unofficially confirmed in public agents’ private conversations. Besides, local residents place pictures of the explosion consequences and victims’ bodies in their blogs. The photo's attached to this email! Send this email to your friends!